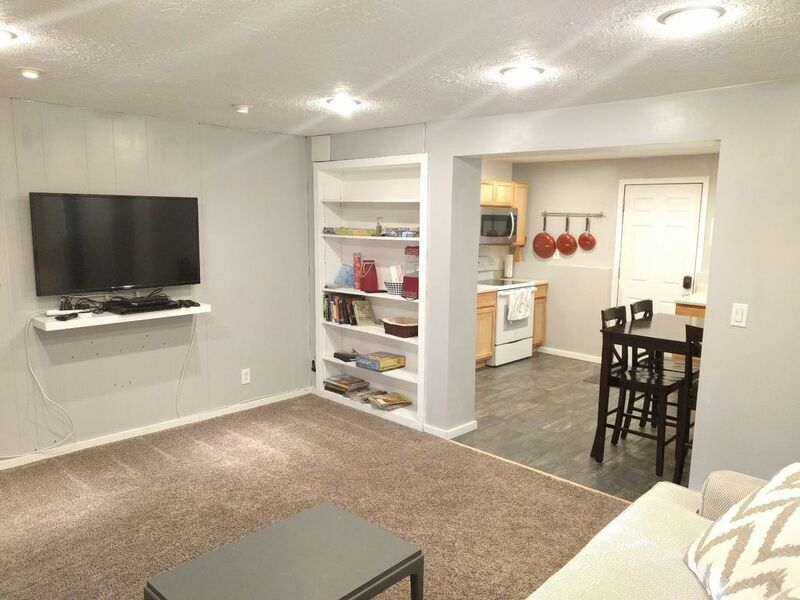 This simple basement apartment offers a nice space with 2 new queen beds and a queen size airbed if needed, private kitchen, common space and bathroom. Keyless entry offers check in at any time. We're only a 20 minute drive to 2 beautiful canyons. This space is in a quiet family neighborhood in a cul-de-sac so traffic is minimal. Public transport is down the road a bit but Uber/Lyft is a great option for getting around. Parking is off the street. This room is just off the kitchen. The couch is pretty big and wonderful to sleep on. If needed I also have an airbed that can be used but given the choice I think most people would prefer the couch. Please note that a tax of 11.6% may not be charged by the booking site and will be collected upon arrival. Lots of room and everything you need for a ski trip. Beds were comfy, and lots of room to stretch out. Not brand new and perfect but very inexpensive compared to a hotel and lots more to offer. Great access to both Cottenwood canyons. Matthew was very responsive with answers and info. All in all a gem in the rough for a great price. The homeowner, Matthew, was very responsive and accommodating and the apartment was clean and well furnished. The beds were very comfortable and the Alexa integration made managing the temperature smooth and convenient. very responsive host, quiet, well stocked unit. Great location. On the few times I had questions for Matthew, I’d send him a text, he always got back within 5 minutes. The unit was exactly as described, clean, well stocked, quiet and a very convenient location. Very positive experience! This was the perfect place to stay. Everything that we needed was within a few miles, even walking distance to some. The apartment was clean and well stocked with supplies. Both bedrooms were good sized and comfortable. We will definitely stay again the next time we are in Salt Lake. Thank you for making our trip amazing.